Dozens of optimization tips. Automatic, easy, effective. How does your website rank in comparison to your competitors? 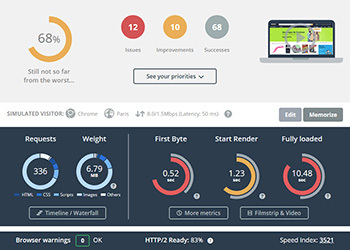 If your site is 20% slower, its loading time will be noticeably different to your users. Dareboost can make sure that your loading time and the quality of your website is an asset rather than an obstacle to the users’ experience. We use Dareboost as a synthetic monitoring tool to oversee the front-end performance of our core pages. For us, user experience is paramount and Dareboost provides the right balance between technical and business insights, with helpful health-check overviews for product owners and sufficiently detailed data for developers. 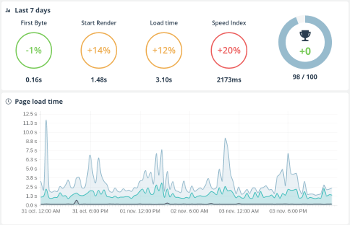 Among Dareboost's strongest features are granular testing frequency, customisable network conditions (desktop and mobile), performance budget alerts, side-by-side comparison between tests and interactive performance graphs. Their customer support deserves a special mention.